Adventure Alpaca my bags! Keep your wanderlust alive and carry it over to your dreams with a subtle reminder from the PJ Salvage Adventure Awaits Crewneck Fleece. Ever wonder what it'd be like to wear clouds on your legs Score yourself a pair of PJ Salvage Cozy Pants and we think you'll find out! CLOSEOUTS. Extra fluffy and warm, this PJ Salvage Cozy short robe has a stylish, color block look and offset button closure. Fabric face is faux shearling. Available Colors: BLACK. Sizes: XS, S, M, L.
Don't limit your dreams rev that REM cycle and go anywhere you can imagine in the unique motorcycle styling of the PJ Salvage Moto Crewneck Sweatshirt. Embrace the chill and kick back in the PJ Salvage Navajo Wanderer Crewneck Fleece. Made up PJ's gloriously soft peachy jersey fabric, this stylishly patterned crewneck turns a day of lounging into an experience in its own right. 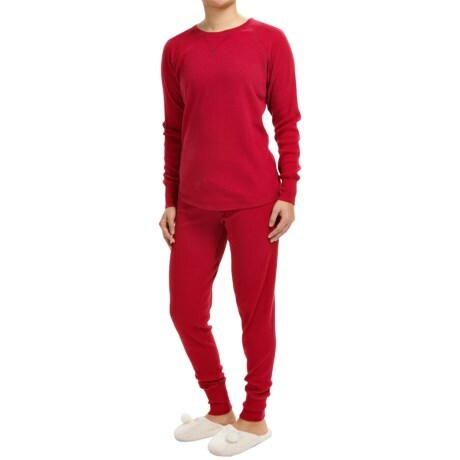 PJ Salvage Ostrich Flannel Pajama Pants, Fuchsia.